I look for inspiration every day. I don’t do it on purpose, I just try to notice when the spark happens. When inspiration hits, I try to do something with it–even if it’s just sitting still for 5 minutes to think about how I can incorporate that spark, that learning, that catalyst for action, into my life. I was incredibly inspired when I watched the movie Herb & Dorothy earlier this year. These people are some of the most bomb Super Frugers you will ever meet! They inspired me to live my life doing what I love. And who cares what other people think. Here’s what the story is about. I am quoting directly from the movie’s ABOUT page. 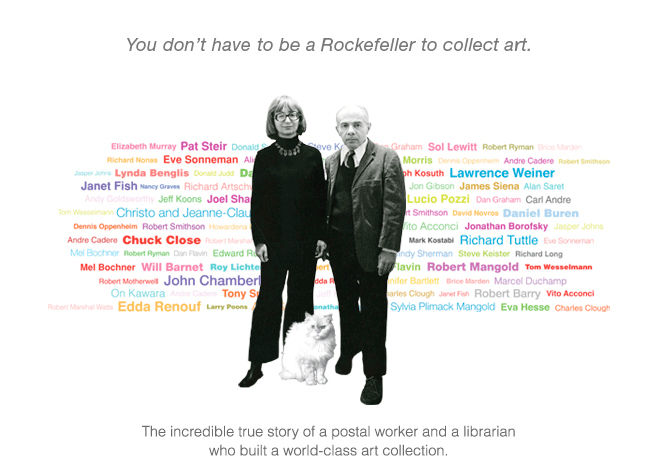 HERB & DOROTHY tells the extraordinary story of Herbert Vogel, a postal clerk, and Dorothy Vogel, a librarian, who managed to build one of the most important contemporary art collections in history with very modest means. In the early 1960s, when very little attention was paid to Minimalist and Conceptual Art, Herb and Dorothy Vogel quietly began purchasing the works of unknown artists. Devoting all of Herb’s salary to purchase art they liked, and living on Dorothy’s paycheck alone, they continued collecting artworks guided by two rules: the piece had to be affordable, and it had to be small enough to fit in their one-bedroom Manhattan apartment. Within these limitations, they proved themselves curatorial visionaries; most of those they supported and befriended went on to become world-renowned artists including Sol LeWitt, Christo and Jeanne-Claude, Richard Tuttle, Chuck Close, Robert Mangold, Sylvia Plimack Mangold, Lynda Benglis, Pat Steir, Robert Barry, Lucio Pozzi, and Lawrence Weiner. After thirty years of meticulous collecting and buying, the Vogels managed to accumulate over 2,000 pieces, filling every corner of their tiny one bedroom apartment. “Not even a toothpick could be squeezed into the apartment,” recalls Dorothy. In 1992, the Vogels decided to move their entire collection to the National Gallery of Art in Washington, DC. The vast majority of their collection was given as a gift to the institution. Many of the works they acquired appreciated so significantly over the years that their collection today is worth millions of dollars. Still, the Vogels never sold a single piece. Today Herb and Dorothy still live in the same apartment in New York with 19 turtles, lots of fish, and one cat. They’ve refilled it with piles of new art they’ve acquired. Watch the movie. It is an incredible example of how you can follow your heart and live the life you want to live, even on a modest income. Herb and Dorothy Vogel, you are my Super Frug heroes. And props to first-time filmmaker Megumi Sasaki for making such a fantastic film. This entry was posted in Fun & Entertainment, Super Frug Heroes by Peg. Bookmark the permalink. Peg: this is awesome!! Love it! I definitely need to ck that movie out. What a great take on being super-froog. I must admit, this kind of approach (and passion for art collecting) never occurred to me, as one way a super-frugal person might go about things. Total aside: My husband and I visited the National Gallery of Art for the very first time last Fall during our (super-froog) Jet Blue, All-You-Can-Jet-Trip. We both agree, it was probably one of the top 3 highlights of everything we saw in DC and NYC, and we *still* talk about it. I wonder if we saw any of the Vogel’s pieces? You probably saw several of the Vogels’ pieces of art, Laila! The National Gallery of Art sounds like an awesome place. I hope to visit someday. I also hope to take advantage of the Jet Blue All-you-Can-Jet-Trip someday. If you plan it right, you can see a ton of cities and new places and still be Super Frug. It is with deep sadness that I let you know that yesterday on July 22, 2012, beloved art collector Herbert Vogel passed away in New York City. He was 89 years old. If you would like to leave any comments or messages for Dorothy, please visit their Facebook page, as Dorothy reads all of the messages directly. Herb, you were a great inspiration to me and so many others. Thank you for your discerning eye, your passion for art, and your incredible generosity in sharing the art you collected with Dorothy with future generations. You will be missed. A great and very comprehensive obituary on Herb by the Washington Post. I will bet that Herb never thought he would ever have something like this written about him when he and Dorothy first started collecting art 50 years ago. Amazing man.